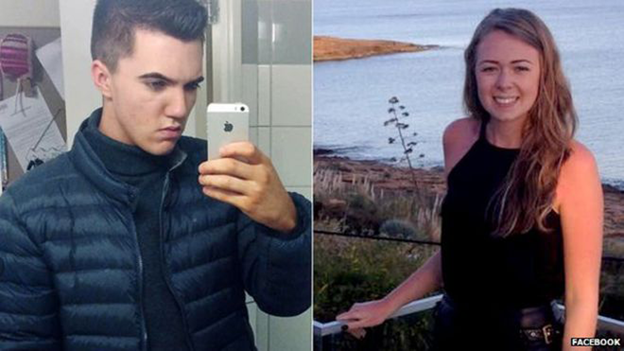 Two teenagers have been named as victims of the Alton Towers rollercoaster accident. Joe Pugh, 18, from Barnsley, and his girlfriend Leah Washington were riding on the Smiler ride on Tuesday. Two carriages crashed on the ride at the Staffordshire theme park on Tuesday, leaving some passengers trapped for four-and-a-half hours about 25ft (7.6m) up in the air. Two men, 27 and 18, a woman, 19, and a girl, 17, have serious leg injuries. Oaks Working Men's Club, in Barnsley, where Joe works said: "We at The Oaks WMC would like to extend our prayers and best wishes in the speedy recovery of our barman Joe Pugh and his girlfriend Leah Washington." Alton Towers said on social media that it would be closing the park on Thursday, as an investigation into the cause of the accident continued. Nick Varney, chief executive of the park's owners Merlin Entertainments, said: "A full investigation is now under way and we will continue to work closely with the emergency services and the Health and Safety Executive to better understand the cause of this terrible accident,"
The accident happened at around 14:00 BST on Tuesday, leaving 16 people stuck in the air at an angle of about 45 degrees. The park said the carriage carrying the people was travelling at 20mph when it crashed. Four people were airlifted to major trauma centres across the West Midlands.